WHY IT RATES: The award-winning luxury river cruise line revealed detailed itineraries for its highly anticipated 2021 sailings throughout Europe. —Patrick Clarke, TravelPulse Senior Writer. Crystal River Cruises, the World’s Most Luxurious River Cruise Line, announced the complete deployment for its award-winning fleet in 2021 giving travelers nearly three years in advance to plan luxury vacations along Europe’s rivers. 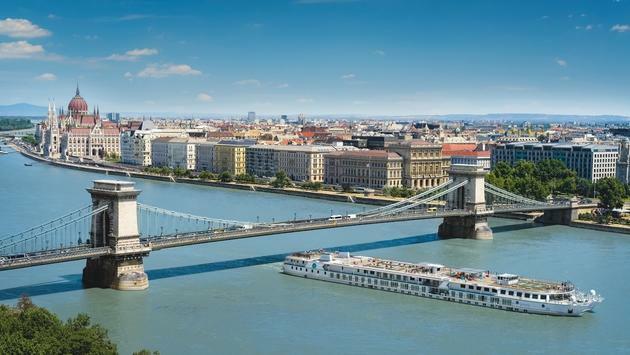 The line’s five luxury river ships—Crystal Mozart and the four identical sister ships Crystal Bach, Crystal Debussy, Crystal Mahler and Crystal Ravel—will sail the Danube, Rhine, Main and Moselle rivers on itineraries of seven to 16 days. With 45 unique ports of call, dozens of which are designated UNESCO World Heritage Sites, every voyage features at least one overnight stay, many with double and even triple overnights, allowing guests to further immerse themselves in the ports’ charm and history, or venture to nearby towns for broader experiences. “We have seen such great demand and increasing desire by luxury travelers to secure their ideal European vacations earlier than ever and we are pleased to make our complete offerings for 2019, 2020 and now 2021 available for booking,” said Walter Littlejohn, Crystal River Cruises’ vice president and managing director. “Not only does this advance ability to plan help ensure that our guests enjoy their Crystal River Experience precisely the way they wish, but our Book Now Savings adds more incentive to book early, guaranteeing the best fares for guests who plan ahead." “In 2021, more than 180 Crystal River Cruises’ departures invite the most discerning travelers to experience the nuances of true luxury on Europe’s rivers—a standard unmatched by any other line. UNESCO-recognized Old Towns in Bamberg and Brugge, epicenters of art and music in Vienna and Salzburg and dramatic landscapes like the Wachau Valley and Middle Rhine Valley add historic and natural flavor to itineraries that also feature contemporary hubs like Düsseldorf and Basel,” Littlejohn added. The “Eastern Danube Discoveries” voyage will debut on Crystal Mozart offering deeper exploration of Hungary as well as Serbia and Croatia. Other itineraries highlight the seasonal delights of riverside destinations, like springtime “Tulips & Windmills” sailings that explore the flower-laden fields of the Netherlands and Belgium; and winter sailings that focus on the dazzling spectacles of the region’s famed Christmas markets. Crystal will also sail the river less traveled, with “Enchanting Moselle” voyages through the scenic Moselle Valley. Featuring overnights in Koblenz and Amsterdam; calling in Cologne, Rüdesheim and Mannheim, Germany; and Strasbourg, France. Featuring overnights in Koblenz and Amsterdam; calling in Cologne, Rüdesheim and Mannheim, Germany; and Strasbourg, France, and cruising through Boppard and Lorelei, Germany. Beginning and ending with overnight stays in Amsterdam; calling in Kinderdijk, Hoorn, Rotterdam and Middleburg, Netherlands; and Ghent and Antwerp, Belgium. Featuring overnight stays in Amsterdam, Netherlands and Trier, Germany; calling in Dusseldorf, Koblenz, Bernkastel, Cochem and Bonn, Germany; and Arnhem, Netherlands. Beginning and ending with overnights in Basel and Amsterdam (double overnight), as well as overnights in Koblenz, Germany; calling in Rüdesheim, Speyer, Breisach, Cologne and Strasbourg, France. Beginning and ending with overnights in Vienna; also calling in Esztergom, Budapest, Visegrad, Mohács and Kalocsa, Hungary; Bratislava, Slovakia; Vukovar, Croatia; Belgrade and Novi Sad, Serbia and cruising through Iron Gate Gorge. Featuring overnights in Budapest, Regensburg and Vienna; calling in Dürnstein and Melk, Austria; and Passau, Germany, as well as cruising the Wachau Valley. Featuring overnights in Vienna and Budapest; calling in Dürnstein, Melk, Linz and Krems, Austria; and Bratislava, Slovakia, and cruising the Wachau Valley. Beginning and ending with overnights in Vienna and also overnighting in Budapest and Passau; calling in Bratislava, Slovakia; Dürnstein, Melk and Linz, Austria; and cruising the Wachau Valley. Featuring overnights in Vienna and Budapest; calling in Bratislava, Slovakia; Krems, Melk and Linz, Austria and cruising the Wachau Valley. Overnighting in Budapest, Vienna, Amsterdam, Regensburg (westbound only) and Rüdesheim (eastbound only); calling in Bratislava, Slovakia; Dürnstein and Melk, Austria; and Passau, Regensburg, Nuremberg, Rüdesheim, Bamberg, Cologne, Miltenberg and Würzburg, Germany, as well as Koblenz, Germany and the Rhine Gorge on the westbound route; and cruising the middle Rhine Valley. Beginning and ending with double overnights in Budapest and Regensburg (including New Year’s Eve), respectively, including New Year’s Eve, and also overnighting in Vienna; calling in Passau, Germany; Krems, Melk and Linz, Austria; and Bratislava, Slovakia. Beginning with three nights in Basel (including Christmas Eve and day), ending with a double overnight in Amsterdam (including New Year’s Eve) and also overnighting in Breisach; calling in Strasbourg, France; Mannheim, Worms, Rüdesheim, Koblenz and Dusseldorf, Germany; Arnhem and Lelystad, Netherlands. Beginning with an overnight in Regensburg and ending with a double overnight in Vienna (including New Year’s Eve) and also overnighting in Linz and Budapest; calling in Melk, Austria; Passau, Germany; Esztergom, Hungary; and Bratislava, Slovakia. Crystal’s new-build river vessels are the river cruising industry’s first and only all-balcony, all-suite, all-butler vessels in Europe, with every category of accommodation positioned above the water line. All suites feature Panoramic Balcony-Windows and walk-in closets and dual vanity in the bathrooms are featured in most categories. Sister-ship Crystal Mozart is Europe’s most spacious river ship, at twice the width of any other, and offers an unrivaled number of social spaces, restaurants and the largest spa on the rivers. Fares for Crystal River Cruises’ 2021 voyages start at $2,399 per person. Book Now Savings are up to $2,000 per suite on select voyages through November 30, 2018. Crystal also recently unveiled the complete deployment for 2020, which features new itineraries and special programming, including the decennial Oberammergau Passion Play.